I have always dreamed of being one of those women who wields a curling iron and a blow dryer expertly and ends up with fabulously styled hair that hangs down beautifully, but the reality is that I have almost no patience for fussing with my hair. Plus, I prefer to have it off my face, which means that I spend about 95 percent of my life with my hair pulled back in a ponytail. I also have a lot of hair, which makes for a pretty heavy ponytail. So it takes something extra strong to keep it in place and looking good. In my early years, I futzed around with those classic elastics with the little metal crimped piece that always catches in your hair and even—gasp!—scrunchies. (It was a different, more innocent time then…) But I never could find anything that held the hair tightly enough, and I was having to constantly redo my ponytail, which drove me nuts. At some point, many years ago now, though I cannot remember exactly when, I happened to be in a Sephora, roaming around that aisle where they have all those tweezers and other fascinating looking instruments. I saw a few beakers filled with what looked like tall matchbooks. I discovered that they in fact held neat little stacks of hair elastics. I bought a book of them, and I haven't looked back since. 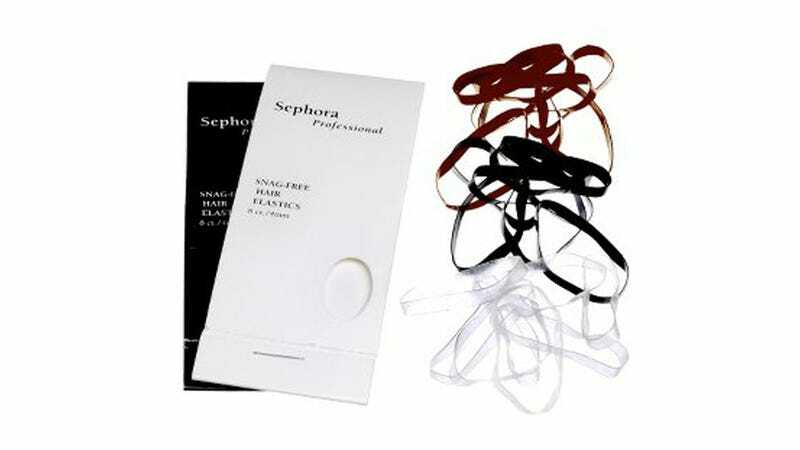 They're called simply Sephora Snag-Free Hair Elastics, and they are amazing. They're just little circles of elastic, but they somehow manage to hold hair in place with a kind of death-grip. I've used them on tiny, spiky little ponytails (like when I'm growing my hair out and desperately trying to get it to stay back) and braids and really heavy ponytails when my hair is at its longest, and they hold all of them equally well. They get a good grip, but they don't break your hair or pull too hard on it. They're also not at all bulky, and they come in three different shades (clear, brown, and black), so you can get them to blend in with any hair color. I've tried drugstore equivalents, but I've never found them to be as good. The Sephora elastics take a freakishly long time to get really stretched out and unusable, and they hardly ever break—like I think I've had a few of them for years now. As a consequence, I don't go through books of them very fast. They're $3.50 for a pack of 8, but honestly it takes me at least a year to go through that many, and that's mostly because I lose them. The matchbook packaging is also great if you want to throw a whole pack in your bag in case of ponytail emergencies. I am not kidding when I say I use one of these every single day, and if I ever find out that I don't have one on me, like when I'm traveling, I start to feel a little panicky. That is how addicted I am to these magical little elastic circles.